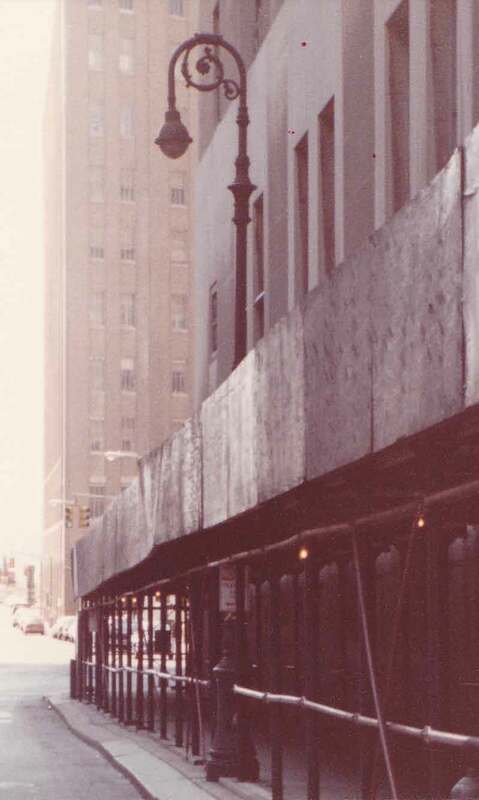 Another poor forgotten old cast iron lamppost, found somewhere in lower Manhattan in 1982, and promptly lost again, because I didn't think to keep track of the locations. This Bishop Crook pole ought to be worried to death something might fall on it and hasten its already overdue demise, being that its trapped in the scaffold with its head exposed to any falling construction debris from above. You'd never know what kind of angst might be flowing through its rusty old cast iron tubing however, because of the ever calm, almost cult-like smile that its Cuplight luminaire seems to give off. I think the smiley visage of this 1940s-1950s era pendant fixture is the biggest reason I grew very fond of them as a little boy. Yeah, I know, it's not the most normal thing to do, insinuating facial expressions on the diffuser bowls of street lights, but somebody has to do it.